On Cooking: I Can Do That! For a couple of weeks last December, I had to take an unplanned trip to Manila. My children were still in school, so I went by myself. Thanks to Apple’s Face Time, I was always in the loop. The first night I was away, I got a detailed account of the children’s first morning without me: At 6AM, a full hour before they usually wake up, they went to the kitchen and started cooking scrambled eggs. My 7-year old was already plating his dish when my husband discovered what he was doing. I was told that my daughter, 5, had her bowl of beaten eggs, and was waiting patiently for her turn to use the frying pan. I heard that they were both beaming with pride! After I calmed down from the initial shock of the children firing up the stove (it was electric), I thought about how thrilled they must have been of accomplishing a task without an adult. They were hungry, they wanted eggs, and so they cooked eggs. The excitement in their voices, when they told me about their accomplishment, told me that they were just as proud of themselves as I was of them. They made a statement: They are independent. I quickly thought about why they would think that they would be successful in cooking– they are comfortable working in the kitchen, and they know the safety rules. I think that they attempted to cook on their own because they know they can. Encouragement and support do play a huge role in fostering independence. They are my proof! 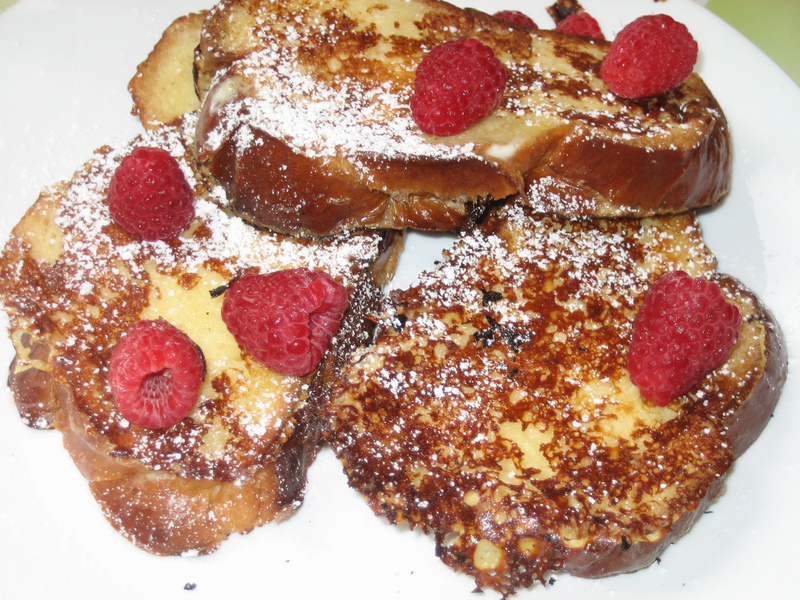 Their cooking repertoire has expanded to include French Toast, and a bit more since then. On weekends now, my two children take turns making breakfast. My son would alternate between French Toast and Champorado (see earlier post for recipe) and my daughter would make pancake. As long as the enthusiasm to cook is there, I will keep on encouraging them. I would hate for this to turn into a ningas cogon (aka an interest that starts with great intensity, but fades quickly). Sadly, a trait that Filipinos are known to possess. In a bowl, mix all the ingredients except of the bread. Dip each slice of bread long enough to absorb the custard, but not too long that the bread becomes soggy. Put on a well-buttered pan and cook on medium heat until golden brown. Flip to cook the other side. Serve warm with topping of cottage cheese, fresh fruits, and maple syrup. Posted in Filipino Custom, Filipino Recipe and tagged breakfast, children cooking, condensed milk, cooking, encouragment, family, food, french toast, independence, ningas cogon, parenting, self confidence, support, teaching independence. Bookmark the permalink.